This is a solenoid driven gate lock meant for absorbing impacts and pressure on the gate rather then the pressures being exerted on the gate opener motors. The gate lock has a wire that leads back to the control board of the gate opener. The control board releases the gate lock at the same time that it runs the motors of the gate opener - leaving your system a fully automated system. The gate lock has a manual key release in instances of power loss to manual open the gate. This device is especially handy in area with high winds or remote areas where people may mistake your driveway for a continuation of the road and try to push your gate open. 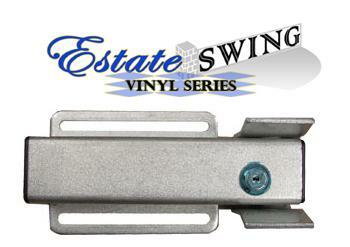 There are two components to the lock; a mechanized side and a receiving bracket. The mechanized side always goes on the gate for a single gate and on the primary gate for a dual gate. This way the wire can be run down the frame of the gate and across where the hinges are to the control board for activation. The receiving bracket either goes on an adjacent post for a single gate or on the secondary gate leaf for dual gates. For single gates the rear face of the gate must match flush with the rear face of the adjacent post - if it does not use the column mount lock receiver.